In a large pot, bring water and ½ tablespoon of the salt to a boil. Add the chopped greens to the boiling water, pushing them down so they are fully submerged. 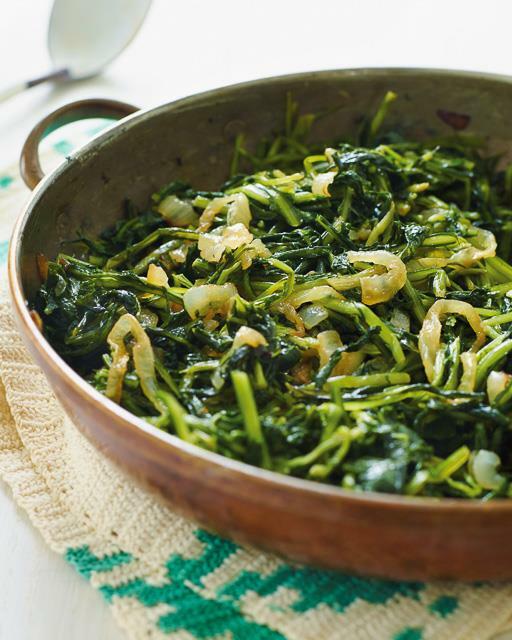 Boil the greens, uncovered, for 15–20 minutes, making sure to periodically push them down so they blanch evenly. While they are cooking, fill a large mixing bowl with ice cubes and cold water. After about 15–20 minutes, test the tenderness of the greens by rubbing a stem or two between your fingers. If they are slightly squishy, then they are cooked. Immediately remove the greens from the heat, drain, and transfer to the ice-water bath to stop the cooking process and set the color. While the greens are cooling, combine the 1⁄3 cup of the olive oil and onion slices in a large sauté pan over medium-high heat and sauté, stirring occasionally, until caramelized to a golden-brown color, 10–12 minutes; do not burn. When the onions have caramelized, reduce the heat to low. Drain the cooled greens in a colander, and squeeze as much excess water as possible with your hands. Add the blanched greens to the sauté pan, pulling apart the small clumps with your hands. Stir into the caramelized onions to combine, season with the remaining ½ teaspoon salt, and sauté until the greens are heated through. Taste, and add additional seasonings as needed. Drizzle with the remaining 2 tablespoons olive oil, and serve warm at room temperature or cold.